WARNING: It is important that you use this medication properly to help reduce your risk of side effects. Your doctor may adjust your dose if you are older, have low body weight, or have kidney problems. Nonsteroidal anti-inflammatory drugs (including ketorolac) may rarely increase the risk for a heart attack or stroke. The risk may be greater if you have heart disease or increased risk for heart disease (for example, due to smoking, family history of heart disease, or conditions such as high blood pressure or diabetes), or with longer use. Talk to your doctor about the benefits and risks of taking this drug. This drug may infrequently cause serious (rarely fatal) bleeding from the stomach or intestines. This effect can occur without warning at any time while taking this drug. Older adults may be at higher risk for this effect. Do not use this medication if you have stomach/intestinal problems (such as bleeding, ulcers). 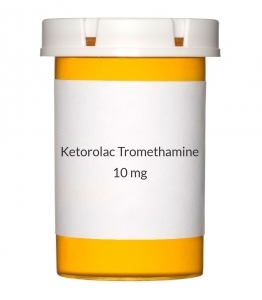 Stop using ketorolac and seek immediate medical attention if you notice any of the following rare but serious side effects: bloody or black/tarry stools, persistent stomach/abdominal pain, vomit that looks like coffee grounds, chest/jaw/left arm pain, shortness of breath, unusual sweating, weakness on one side of the body, sudden vision changes, slurred speech. This drug should not be taken right before or after heart bypass surgery (CABG) or before any surgery. It also should not be used during labor/delivery or in people with severe kidney problems or high risk for kidney problems. Do not use ketorolac if you are taking high doses of aspirin or other nonsteroidal anti-inflammatory drugs (NSAIDs). See also Drug Interactions section. USES: Ketorolac is used for the short-term treatment of moderate to severe pain in adults. It is usually used before or after medical procedures or after surgery. Reducing pain helps you recover more comfortably so that you can return to your normal daily activities. This medication is a nonsteroidal anti-inflammatory drug (NSAID). It works by blocking your body's production of certain natural substances that cause inflammation. This effect helps to decrease swelling, pain, or fever. Ketorolac should not be used for mild or long-term painful conditions (such as arthritis). HOW TO USE: Read the Medication Guide and, if available, the Patient Information Leaflet provided by your pharmacist before you start taking ketorolac and each time you get a refill. If you have any questions, ask your doctor or pharmacist. Take this medication by mouth, usually every 4 to 6 hours with a full glass of water (8 ounces or 240 milliliters), or as directed by your doctor. Do not lie down for at least 10 minutes after taking this drug. If stomach upset occurs while taking this medication, take it with food, milk, or an antacid. Dosage is based on your medical condition and response to treatment. To reduce your risk of stomach bleeding and other side effects, take this medication at the lowest effective dose for the shortest possible time. Do not increase your dose, take it more frequently, or take it for longer than 5 days. If you still have pain after 5 days, talk with your doctor about other medications you may use. Do not take more than 40 milligrams in a 24-hour period. If you are taking this drug "as needed" (not on a regular schedule), remember that pain medications work best if they are used as the first signs of pain occur. If you wait until the pain has worsened, the medicine may not work as well. Tell your doctor if your condition worsens or if your pain is not relieved. SIDE EFFECTS: See also Warning section. Upset stomach, nausea, vomiting, constipation, diarrhea, gas, dizziness, or drowsiness may occur. If any of these effects persist or worsen, tell your doctor or pharmacist promptly. Remember that your doctor has prescribed this medication because he or she has judged that the benefit to you is greater than the risk of side effects. Many people using this medication do not have serious side effects. Tell your doctor immediately if any of these unlikely but serious side effects occur: fainting, fast/pounding heartbeat, hearing changes (such as ringing in the ears), mental/mood changes (such as confusion, depression), persistent/severe headache, stomach pain, sudden/unexplained weight gain, swelling of the hands or feet, vision changes (such as blurred vision), unusual tiredness. Tell your doctor immediately if any of these rare but serious side effects occur: easy bruising/bleeding, change in amount of urine, signs of infection (such as fever, chills, persistent sore throat), symptoms of meningitis (such as unexplained stiff neck, fever). This drug may rarely cause serious (possibly fatal) liver disease. Seek immediate medical attention if you have any symptoms of liver damage, including: dark urine, stomach/abdominal pain, persistent nausea/vomiting, yellowing eyes/skin. A very serious allergic reaction to this drug is rare. However, seek immediate medical attention if you notice any symptoms of a serious allergic reaction, including: rash, itching/swelling (especially of the face/tongue/throat), severe dizziness, trouble breathing. This is not a complete list of possible side effects. If you notice other effects not listed above, contact your doctor or pharmacist. In the US - Call your doctor for medical advice about side effects. You may report side effects to FDA at 1-800-FDA-1088. In Canada - Call your doctor for medical advice about side effects. You may report side effects to Health Canada at 1-866-234-2345. PRECAUTIONS: Before taking ketorolac, tell your doctor or pharmacist if you are allergic to it; or to aspirin or other nonsteroidal anti-inflammatory drugs-NSAIDs (such as ibuprofen, naproxen, celecoxib); or if you have any other allergies. This product may contain inactive ingredients, which can cause allergic reactions or other problems. Talk to your pharmacist for more details. Before taking this medication, tell your doctor or pharmacist your medical history, especially of: asthma (including a history of worsening breathing after taking aspirin or other NSAIDs), bleeding or clotting problems, blood disorders (such as anemia), heart disease (such as congestive heart failure, previous heart attack), high blood pressure, kidney disease, liver disease, growths in the nose (nasal polyps), throat/stomach/intestinal problems (such as bleeding, heartburn, ulcers), stroke, swelling of the ankles/feet/hands, a severe loss of body water (dehydration). This drug may make you dizzy or drowsy. Do not drive, use machinery, or do any activity that requires alertness until you are sure you can perform such activities safely. Avoid alcoholic beverages. This medicine may cause stomach/intestinal bleeding. Daily use of alcohol and tobacco, especially when combined with this medicine, may increase your risk for stomach bleeding. Limit alcohol and stop smoking. Consult your doctor or pharmacist for more information. This medication may infrequently make you more sensitive to the sun. Avoid prolonged sun exposure, tanning booths, and sunlamps. Use a sunscreen and wear protective clothing when outdoors. Before having surgery, tell your doctor or dentist about all the products you use (including prescription drugs, nonprescription drugs, and herbal products). Older adults may be more sensitive to the effects of the drug, especially bleeding in the stomach/intestines or effects on the kidneys. Using high doses for a long time may increase this risk. Before using this medication, women of childbearing age should talk with their doctor(s) about the benefits and risks (such as miscarriage). Tell your doctor if you are pregnant or if you plan to become pregnant. During pregnancy, this medication should be used only when clearly needed. It is not recommended for use during the first and last trimesters of pregnancy due to possible harm to the unborn baby and interference with normal labor/delivery. This drug passes into breast milk in very small amounts and may have undesirable effects on a nursing infant. Breast-feeding while using this drug is not recommended. Consult your doctor before breast-feeding. DRUG INTERACTIONS: The effects of some drugs can change if you take other drugs or herbal products at the same time. This can increase your risk for serious side effects or may cause your medications not to work correctly. These drug interactions are possible, but do not always occur. Your doctor or pharmacist can often prevent or manage interactions by changing how you use your medications or by close monitoring. To help your doctor and pharmacist give you the best care, be sure to tell your doctor and pharmacist about all the products you use (including prescription drugs, nonprescription drugs, and herbal products) before starting treatment with this product. While using this product, do not start, stop, or change the dosage of any other medicines you are using without your doctor's approval. Some products that may interact with this drug include: methotrexate, probenecid, high blood pressure drugs (including ACE inhibitors such as captopril, lisinopril and angiotensin II receptor blockers such as losartan, valsartan), corticosteroids (such as prednisone), other medications that may affect the kidneys (including cidofovir, cyclosporine, tenofovir, "water pills"/diuretics such as furosemide, hydrochlorothiazide, triamterene). This medication may increase the risk of bleeding when taken with other drugs that also may cause bleeding. Examples include anti-platelet drugs such as clopidogrel, "blood thinners" such as dabigatran/enoxaparin/warfarin, among others. This medication can slow down the removal of other medications from your body, which may affect how they work. Examples of affected drugs include lithium, pemetrexed, among others. Check all prescription and nonprescription medicine labels carefully since many medications contain pain relievers/fever reducers (aspirin, NSAIDs such as ibuprofen or naproxen). These drugs are similar to ketorolac and may increase your risk of side effects if taken together. However, if your doctor has directed you to take low-dose aspirin to prevent heart attack or stroke (usually at dosages of 81-325 milligrams a day), you should continue taking the aspirin unless your doctor instructs you otherwise. Ask your doctor or pharmacist for more details. This document does not contain all possible interactions. Therefore, before using this product, tell your doctor or pharmacist of all the products you use. Keep a list of all your medications with you, and share the list with your doctor and pharmacist. OVERDOSE: If overdose is suspected, contact a poison control center or emergency room immediately. US residents can call the US National Poison Hotline at 1-800-222-1222. Canada residents can call a provincial poison control center. Symptoms of overdose may include: severe stomach pain, vomit that looks like coffee grounds, extreme drowsiness, slow/shallow breathing. NOTES: Do not share this medication with others. This medication has been prescribed for your current condition only. Do not use it later for another condition unless your doctor directs you to do so. A different medication may be necessary in that case. MISSED DOSE: If you are taking this medication on a regular schedule (not just "as needed") and you miss a dose, take it as soon as you remember. If it is near the time of the next dose, skip the missed dose and resume your usual dosing schedule. Do not double the dose to catch up.